CLICK here for high resolution printable trail map (1.27 MB). 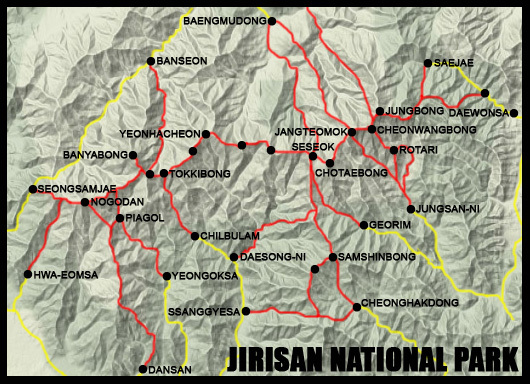 The western half of Jirisan National Park, which lies mostly in Gurye and Namwon Counties, is lower in elevation than the eastern half and less rugged, but no less beautiful. The major peaks along the western ridge include: Nogodan (1,507 m), Banyabong (1,733 m), Tokkibong (1,534 m), Myeongseonbong (1,586 m), and Samgakbong (1,462 m). Nogodan and Banyabong are the big local attractions on the ridge, while the Piagol Valley hike is extremely popular in autumn. The same is true of the west as of the east--there are plenty of lodgings and places to eat at most of the major entry points, including Hwa-eomsa Service Complex, Seongsamjae Village, Yeongoksa Service Complex, and Banseon Service Complex. Expect to pay between W20,000 and W30,000 for a single room and W6,000-8,000 for a decent meal. Gurye has shops near the bus terminal with basic hiking equipment, stoves, maps, gas, and some food items. Campgrounds cost W3,000-7,000 per night. Facilities vary. Call the park office to make reservations. With the exception of Nogodan, the western shelters are quite small and simple. When we were there in mid-November, Baemsagol Shelter was closed to hikers and there was no information about when it would be re-opened. With the exception of Piagol and Baemsagol, the rest of the shelters require reservations. Bring your own food, cook stove, and sleeping pad. Blankets can be rented for overnight use. Simply click on the link below and follow the directions on the page to make reservations at any of the shelters at Jirisan. The park service will confirm your reservation by email within 1-2 days. Reservations can be made 2 weeks in advance. The largest of the western shelters, Nogodan accommodates about 100 people. This shelter is located not far from civilization (Seongsamjae Village), so expect plenty of company. Make your reservations early. This small shelter is about 2 kilometers down the Piagol Valley trail from the ridge and does not require reservations. At peak times of the year, you'd have to get there early to get a spot to sleep. This shelter was deserted and appeared to be not operational in August 2008. Call before you start your trip. Baemsagol is another small, simple shelter, located at the bottom of a long series of steep stairs, leading north from the ridge. As mentioned above, it was closed when we passed by in mid-November 2008. Call the park service before making any plans to stay there. Even when closed, you can cook in the area around the shelter and there's a freshwater spring right outside the building. Yeonhacheon accommodates about 35 people. There's a freshwater spring not far from the building. Despite what it says on the KNPS website, both Nogodan and Banyabong peaks were open to hikers as of November 10, 2007. There are no other closures that I know of that would affect people on the western trails.